If you are using a Windows computer, it is very easy to change the background to something awesome by using a seamless texture. The instructions provided work in Windows 7 and 8, though you can also do this in earlier versions of Windows with minor modifications of the steps provided. In both Windows 7 and 8, the steps are nearly identical. Start by right-clicking on the desktop background and choose Personalize from the pop-up menu that appears. This will bring you to a dialog box similar to the one shown below. Along the bottom row of icons, you’ll see one of them is named Desktop Background. When you click on it, you’ll get the dialog box shown below. A seamless texture is a “picture” so you want to click Browse and navigate to the folder where the desired seamless texture is stored. In this example, a corroded diamond plate pattern from Textures Unleashed Volume 2 was chosen. With the disc-based collection you get four sizes so you can choose exactly how much detail you want shown on your background. In the example above, the seamless texture sized at 256x256 pixels was selected. 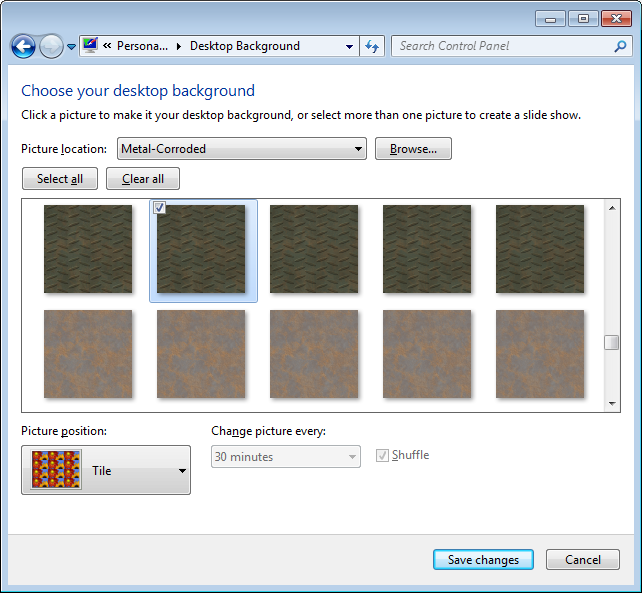 For the Picture position, make sure to choose Tile so that the seamless texture will be repeated to fill your desktop. Click Save changes and you’ll be all set. For those really adventurous, you could choose several seamless textures set to change the picture every 30 minutes. That way you are regularly getting something different!